UNITED STATES SHIP TERRY (DD-5l3) Thursday March 1, 1945. 08-12 Lying to as before. 0801 Gyro compass returned to operation. The following officers of the medical corps came aboard as soon as possible during the morning, assisted in caring for the wounded and were later returned to their respective ships: Commander Bear and Lieutenant (jg) Fitzpatrick of: the USS Nevada, Lieutenant Becker of the USS Boyd, Lieutenant (jg) Butler of the USS Mc Call, Lieutenant (jg) Shaunnessy of the USS 0' Hara and Lieutenant (jg) Cronemiller of the USS Fremont; Lieutenant (jg) Rudy, assistant engineer of USS McCall DD400) and about 17 men from that ship's Repair Party came on board also and rendered most valuable assistance. 0845 Regained emergency electric power, steering control and use of port engine and #4 boiler. Forward engine room flooded to water line. 0900 On various courses at various speeds underway to transport area off East coast Iwo Jima to close USS Solace in order to transfer wounded. 0940 Commenced lying to in transport area. Iwo Jima., in vicinity of USS Solace. KECK, Gordon W., 385 75 08, CMM(AA), USNR. 1127 USS Tawakoni (ATF 114) transferred pump to USS Terry. 1150 Secured from General Quarters. Set condition of readiness II. C. R. GELLNER, Lieutenant, USNR. 12-16 Lying to as before. 1212 Commenced pumping water from forward engine room. 1407 Steaming on course 170 deg T, speed 8 knots (port engine) retiring from 1wo Jima to perform burial services as authorized by CTF 51. 1600 Lieutenant J.J. Eusack (ChC),.USNR, Catholic chaplain from USS Auburn and Lieutenant (jg) C.W. Junker (ChC), USNR. Protestant chaplain from USS El Dorado commenced burial services. Burial took place at Latitude - 24deg-47min N. Longitude - 141deg 19min E in 205 fathoms of water. J. 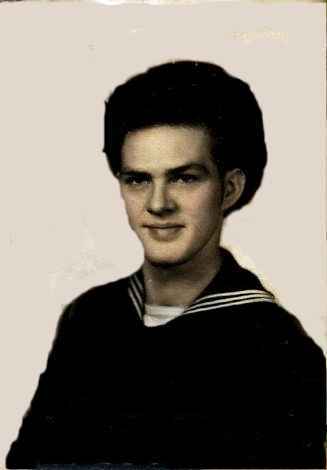 B. LAHRMER, Lieutenant, USNR. Thanks to Kathy Smith who provided these logs of Terry Action. This is Kathy Smiths Uncle, Wayne LeCrone F1c, Dob 10/10/23. Killed during this action. Return to Bob's Home Page.